It was also the first city captured by the Israelites upon entering the land of Canaan following their 40 years of wandering in the desert after the exodus from Egypt. Ironically, Jericho (along with the Gaza Strip) was the first territory given to the Palestinians by Israel as part of the Oslo peace agreement in 1994. Before the outbreak of the Palestinian War in 2000, the Palestinian Authority had been developing the town in hopes of making it a major tourist attraction, most notably erecting a large casino and hotel at the outskirts of the city. According to Jewish tradition, after the Israelites' 40-year sojourn in the desert, Joshua decides the first city in Canaan he will conquer is Jericho. God tells him that he will be victorious and instructs Joshua to have his troops march around the walls of the city once a day for six days. The force is to be led by seven priests walking beside the Ark of the Covenant containing the Ten Commandments and blowing rams' horns (shofarot). On the seventh day, the troops are supposed to circle the city seven more times, then the priests are ordered to blow their horns and the soldiers to shout, and the walls of the city, God tells Joshua, will tumble down. This is precisely what happens according to the Bible (Joshua 6). Jericho later fell to the Babylonians, but was rebuilt when the Jews were allowed to return from their exile. The city continued to be a resort during the rule of the succeeding empires. For Christians, Jericho took on importance because of its association with John the Baptist, who was said to have been baptized by the banks of the Jordan on the eastern boundary of the city (Matthew 3:13-15), and the story of the temptation of Christ (Matthew 4:1-4). The Romans destroyed the old city in the first century, but it was rebuilt in its present location by the Byzantines. The city briefly returned to glory when Caliph Hisham Ibn Abd el-Malik built his winter palace in Jericho in 743, but an earthquake destroyed virtually the entire city just four years later. The city later fell to the Crusaders and then was recaptured by Saladin. Jericho was largely ignored and deserted for centuries afterward. The UN partition decision allocated the area to the Arab state, but, after the 1948 war, it was controlled by Jordan. Many Arabs who left other parts of Palestine moved to the area and a number of UN refugee camps were set up. A Palestinian nationalist named Musa Alami founded an agricultural school to train refugees in 1951, which is still in operation. The territory was subsequently captured by Israel in the Six-Day War. Nearby is the Spring of Elisha, or Sultan's Spring, where the prophet sweetened the water (II Kings 2). This is the source of water for the oasis. During the construction of a private home north of the spring, builders discovered the mosaic floor of an ancient synagogue decorated with Jewish symbols, such as a menorah and ram's horn. 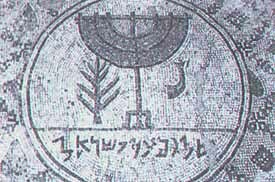 A Hebrew inscription reads, "Peace to Israel." This is the Shalom Al Yisrael Synagogue. A second, older synagogue, which is believed to have been built in the 5th or 6th century, was also discovered by accident. The Na'aran Synagogue was found after the Ottoman Turks shelled a British army unit camped on the spot. It too has a mosaic floor, this one with the Zodiac, the story of Daniel in the Lion's Den and pictures of sacred objects from the Temple. Directly across from the Tel is a huge tourist complex with shops and a restaurant where every tour bus stops. A new hotel is being constructed as well. Another new addition since the Palestinian takeover is a modern cable car that whisks visitors to the Mount of Temptation. A 19th-century Greek Orthodox monastery sits on the cliff. This is where Satan offered Jesus the kingdoms of the world in exchange for his homage. Inside the monastery is a cave where Jesus is believed to have stayed during the 40 days he spent in the wilderness fasting after his baptism. At the foot of the mountain are the remains of the sugar mills built by the Crusaders in the 11th century. Less than two miles from Old Jericho is Caliph Hisham's Palace. The building dates to the 7th century during the Umayyad period of the Muslim Empire. It was apparently designed as a winter resort from the Caliph, but was destroyed by an earthquake before he had a chance to use it. Parts of the building were preserved and some of the artifacts were removed and are on display at the Rockefeller Museum in Jerusalem. Jericho biggest tourist attraction at one point was Oasis casino - built in 1995 following the peace agreement signed between the Palestinians and Israelis- which was the only legal gambling establishment in the region, and a magnet for Israelis. In 1999, it made a profit of $54 million from the close to 2,900 people who visited the casino daily - 99% of them Israelis. In 2000, though, after the outbreak of violence during the Palestinian War, the casino was shut down. The juxtaposition of the casino, located directly across the street from a Palestinian refugee camp, was not lost on Palestinian terrorists who began using its high roof to shoot at nearby Israeli targets. Today the casino remains closed, despite an attempt by an Israeli businessman to reopen it back in 2005. About four miles east of Jericho (six km.) is the Allenby Bridge, one of the two crossing points into Jordan. The bridge is named after the famous general who led British troops during World War I and helped conquer much of the Middle East, including Palestine.